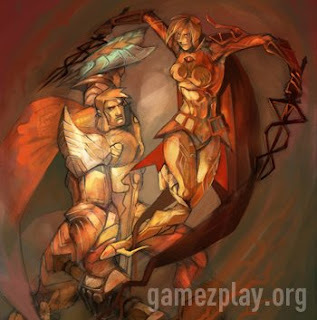 The dark and fantasy world of the free-to-play MMORPG Rappelz will see a refreshing change of scenery with new events introduced between the 18th to the 31st March 2009. The gPotato.eu team has organised a number of themed events to celebrate the coming of Spring while bringing acclaim to the bravery of warriors. There will also be a brand new content update, with lots of new rewards awaiting players of all levels! From 18th to 24th March, players can participate in the special Spring event on Rappelz to celebrate the five magical elements, essential components of the nature spirit. Adventurers have to collect the elements stolen by monsters to benefit from their hidden powers and bring back harmony to the Rappelz landscape. If players release the essence of these elements, they can get numerous bonuses including an increase in their strength or magical attack. They can also put the five elements together to get a magical box containing marvelous treasures like the Red Lydian and the Purple Ornitho special mounts. From the 24th March, the Maea character is back in Rappelz cities, and will reward warriors depending on their level. From level 10 to 50, players can get various items from this character, like the much-sought after Stamina Saver, a special item which highly increases the experience points acquired from battles. Warriors will be exalted once more from the 24th to the 31st March during the special “Combative Spirit” event. For an entire week, players can collect a lot of useful items, giving them the chance to see their character evolved faster in the Rappelz world. Please find attached an exclusive artwork commemorating the warrior spirit in Rappelz by Alex Guillaume, winner of the last “gPotato : art and video games” contest. For additional information, please visit the official website: http://rappelz.gpotato.eu !